When you’re looking for vegetarian food in Germany, you might be worried that you won’t find any food to eat. After all, isn’t Germany the country of sausage and schnitzel? It’s true that traditional German food is heavy on the meat. However, in recent years, the country has embraced vegetarian and vegan cuisine, and today it is almost always possible to find several delicious vegetarian options on every restaurant menu. Sometimes this means the restaurant will adapt a typical German dish, while other times you’ll get to sample foods from across the globe, thanks to Germany’s diverse immigrant community. Earlier this year I traveled to Germany. I spent several weeks between Frankfurt, Dusseldorf, Cologne, Baden-Baden and Berlin, exploring the country and indulging in many of its most delicious vegetarian dishes. Keep reading to see what you can expect to enjoy when you’re eating vegetarian food in Germany. For most of my time in Germany I was staying in hotels or hostels that included breakfast in their room rate. As a vegetarian in Germany, I enjoyed starting my day in a typically German style. Generally speaking, German hotel breakfasts have several vegetarian options, including a variety of fresh bread, an assortment of cheeses, yogurt, fruit, vegetables and cereal. Most hotels have a few drink options, including water, milk, juice and drip coffee, but there is often an extra charge if you want an espresso-based drink, like a latte or a cappuccino. Some of the hotels I stayed at also had hot dishes at breakfast, although the vegetarian option was typically limited to scrambled eggs, if anything. The exception to my German hotel breakfast experience was at the Hotel Adlon Kempinski, a five-star luxury hotel located beside the Brandenburg Gate in Berlin. Normally, this kind of hotel would be outside my price range, but I did find a great deal on Booking.com! The Adlon is famous for its elaborate breakfast buffet, which includes everything from a champagne assortment to a local honey bar to superfood smoothie shots, on top of the entire a la carte breakfast menu. Here, because the buffet was included in my room rate, I indulged in all sorts of made-to-order hot dishes, including vegetable omelets, potato pancakes and sauteed vegetables. You don’t have to be a guest at the Adlon to enjoy their breakfast buffet, but reservations (and deep pockets!) are recommended for those who want to drop in for this €45 treat. I did end up eating breakfast in a few different restaurants, all of which had excellent vegetarian options. In Cologne, I had breakfast at cafecafe, a trendy breakfast and lunch joint that was just around the corner from my hostel (the amazing Hostel die Wohngemeinschaft, one of the best hostels I’ve ever stayed at, and easily the most beautiful). Their breakfast list had everything from açai bowls to a fully-vegan Mediterranean platter to my avocado toast (shown above). And in Berlin, I stopped in for breakfast at Betty’n Caty, a quaint cafe in Prenzlauer Berg with fresh baked goods, typical hot dishes and more unique offerings, like the berry and pistachio bircher muesli in the photo above. I loved the outdoor seating at Betty’n Caty, where I could watch the locals go about their daily lives. Before I came to Germany, I was worried that as a vegetarian in Germany I wouldn’t be able to enjoy traditional German foods. Fortunately, my fears ended up being unfounded. There are lots of delicious German vegetarian dishes! When you’re in Berlin, you’ll notice the city’s most iconic German vegetarian dish: currywurst. Usually, currywurst consists of a pork sausage that is steamed and then fried, before being tossed in a curry ketchup sauce. Fortunately, it’s surprisingly easy to find vegan versions of currywurst. In a vegan currywurst, the sausage is made from a seasoned seitan (vital wheat gluten) blend. I sampled the vegan currywurst from Curry at the Wall, an iconic fast food stall adjacent to Checkpoint Charlie. As far as vegan German food goes, this dish is a winner! If you’re taking my secret €3 sightseeing tour of Berlin (yes, it’s on a double-decker bus!) then you can start or end your tour at Curry 36, which has a great vegan currywurst on their menu. Obatzda is an iconic German dip, made from combining creamy cheese with spices (usually paprika, salt and pepper) and a little bit of beer. Typically, obatzda is served with bread for dipping. At the Lowenbrau Biergarten in Baden-Baden I had intended to order this dish as an appetizer, but accidentally ordered plain cream cheese with crudites instead. My waistline probably thanked me for that one. For my main course at the Lowenbrau Biergarten I opted for traditional German potato pancakes, served with buttered seasonal vegetables and a side of herbed sour cream sauce. Potato pancakes are common all over Europe (in fact, they are the national dish of Belarus, where they’re called draniki) and can be served sweet (with applesauce, stewed berries or simply powdered sugar) or savory, making them an excellent vegetarian option for any meal. If you’re a vegetarian in Germany, you’ll also want to keep your eyes peeled for spatzle (sometimes spelled spaetzle), which are soft egg noodles that are served in many different styles. In Baden-Baden, I chose kasespatzle, or “cheese spatzle”, made with creamy Emmenthaler cheese and fried onions. Another vegetarian variation is krautspatzle, made with saurkraut and onions. Either way, spatzle is definitely one of the most common German vegetarian dishes, and is served in both homes and restaurants across the country. When all else fails, almost every restaurant in Germany can throw together a plate of side dishes for you. At one of Cologne’s riverfront restaurants I was served this plate, featuring a baked potato (covered in cream sauce, of course) and salad (covered in creamy dressing, of course). The local beer is called Kölsch, and it’s typically served in tiny glasses (200 ml) that come from the bar in a continuous stream, so that your beer never gets warm. Hence all the coasters! The Local has a great rundown of ten classic German dishes that are vegetarian-friendly. Finally, for those of us who aren’t obsessed with healthy eating, Germany has another tradition that is very favorable toward vegetarians: Kaffee und Kuchen. Translating to “coffee and cake”, Kaffee und Kuchen is the tradition of making time in your afternoon for an indulgent treat, a cup of warm coffee, and a little bit of conversation with the people around you. German bakeries are a sight to behold, with everything from Apfelkuchen (apple cake) and Mohnkuchen (poppy seed cake) to soft pretzels and sweet fried cheese donuts. DW has a great rundown of the classic German baked goods that you can expect to find at every bakery. Personally, I usually look for an almond-based dessert like Bienenstich, but every now and then I choose a chocolate-based treat instead, like the delicious chocolate-cherry cake from Baden-Baden’s award-winning Cafe Konig. Even though German food can be very delicious and vegetarian-friendly, it’s often not the best choice for a vegetarian in Germany. You see, Germany is an exceptionally diverse country and the nation’s dining scene reflects that diversity. From immigrant-owned restaurants serving the traditional food of their home countries to fusion restaurants where innovative chefs combine flavors from around the globe, Germany’s diverse food choices are ideal for vegetarian travelers. I had lots of excellent Asian-inspired vegetarian food in Germany. In Berlin, I went to PHO Noodlebar, a new(ish) Vietnamese fusion restaurant with several different vegetarian and vegan options. I opted for their Pho Buddha, featuring tofu, vegetables, enoki mushrooms and fresh herbs. PHO Noodlebar is just a few blocks from one of the coolest hotels in Berlin – Casa Camper. In fact, this part of Berlin is packed with good vegetarian restaurants. In Cologne, there was also a tiny Vietnamese restaurant across the street from Hostel die Wohngemeinschaft called ut Han (it’s so tiny that it’s almost impossible to find using online maps, so just check opposite the hostel). Here, they had a “make your own salad roll” platter featuring rice noodles, three different preparations of tofu and fresh herbs. I dipped each piece of rice paper into the vertical tray holding hot water until it was soft, and then rolled each one up exactly to my liking. Back in Berlin I also stopped at Momos, a restaurant that specializes in Asian-fusion dumplings. When I visited they offered six different vegetarian dumplings (four of which were fully vegan) and three dipping sauces. You could choose a small, medium or large platter of dumplings and have them cooked to order, steamed or fried. Momos is only a block away from PHO Noodlebar and several other cool restaurants, so I when I return to Berlin this summer I will be staying at Hotel 38, right around the corner. Why not stay in a hotel close to my favorite restaurants? Germany doesn’t quite share a border with Italy (Austria and Switzerland get in the way!) but that hasn’t stopped Italian food from making its mark on the German restaurant scene. In Baden-Baden I ate at M10 Cafe & Restaurant, a little place tucked away from the main drag, in the shadow of the Stiftskirche. M10 is a unique restaurant because they employ people with disabilities and other special needs in both kitchen and serving positions. I found the service to be excellent (if my server had special needs, it wasn’t immediately noticeable) and my meal, the daily special featuring a house salad and spinach-stuffed ravioli, was delicious. M10 is super-close to both Friedrichsbad and Caracalla Therme, so it’s a fantastic option for your pre- or post-spa dining. I also had an Italian-inspired dish at Weilands Wellfood, a fast-service restaurant near Potsdamer Platz in Berlin. When I visited they were offering a vegetarian barley risotto with sundried tomato, zucchini, fennel and pesto sauce, and I had the option of adding a grilled tofu steak on top. Their menu changes seasonally, but you can always expect to find international flavors and mix-and-match options to create your own perfect vegan or vegetarian dish. As a Canadian vegetarian, I was especially excited see that a new chain of poutine restaurants is beginning to expand across Germany. Frittenwerk has locations in Frankfurt, Cologne, Dusseldorf, Aachen and Essen. Their classic poutine (shown above) features a vegetarian gravy (yes!) and mozzarella cheese, and they also offer a vegan bolognese version for diners who are completely plant-based. Some say that the hamburger originated in Germany. I wouldn’t know (or care), but I can say that Germany is also home to many of the best veggie burgers I’ve ever eaten! In particular, Berlin is veggie burger heaven! The top photo shows a burger called The Lousy Hunter from The Bird in Berlin. We’re talking about two deep-fried lentil and zucchini patties topped with cheese and then served with fries and a dip of your choice (I went for guacamole). The bottom photo is from Muse, a fusion restaurant in Prenzlauer Berg that had all kinds of cool vegetarian and vegan options, like this vegetable bhaji burger that was served with sweet potato fries. Germany is also home to hundreds of fully vegetarian and vegan restaurants. These plant-based paradises run the gamut from tiny self-serve cafeterias to high-end restaurants serving elaborate, multi-course fixed menus. The first vegan restaurant I visited in Germany was Vevay, in Frankfurt. I went for their signature Vevay Plate (shown above) with a dozen different dishes for me to sample. This was the perfect nutrient-dense jet-lag blaster after a sixteen-hour journey from Canada to Germany. Vevay is completely plant-based, so it’s a great place to sample vegan German food in Frankfurt. In Dusseldorf I checked out Sattgrun, a self-service vegetarian cafeteria where you pay for an empty plate (small, medium or large) and then pile it as high as you can with choices from their hot and cold buffets. There are also rotating soup selections, fresh bread and assorted beverages. I loved taking my plate to the terrace outside the restaurant, but there is lots of inside seating too. Lucky Leek gets very busy, and I was only able to snag a same-day booking at the first seating, around 5:00 or 5:30 pm (which was fine, as I had an intercity train to catch at 10:00 pm). Reservations are definitely recommended for Lucky Leek and any of other “best” vegetarian restaurants in Berlin, like Kopps and Cookies Cream (the latter has hosted celebrities like George Clooney!). Overall, I found that it was easy to find vegetarian food in Germany. Before my trip I worried that my options might be limited, but I found that by combining classic German favorites with some international and fusion dishes, I was always able to find great vegetarian food in Germany. While Berlin had the widest range of options at every price point, every city I visited had good vegetarian restaurants and lots of vegan options. At times, it felt like the hardest part of eating vegetarian food in Germany was deciphering the beautiful handwriting on restaurant signs placed on the sidewalk! Don’t tell me that’s not the most beautiful penmanship you’ve ever seen… and in Germany, you’ll see it everywhere! Have you been to Germany? What was your favorite vegetarian food in Germany? Let me know in the comments! Planning a trip to Berlin? I’ve visited twice in the last two years, and I’m sharing my favorite hotels in Berlin, my favorite Berlin guidebooks and a top-secret double-decker bus tour that costs less than three euros! 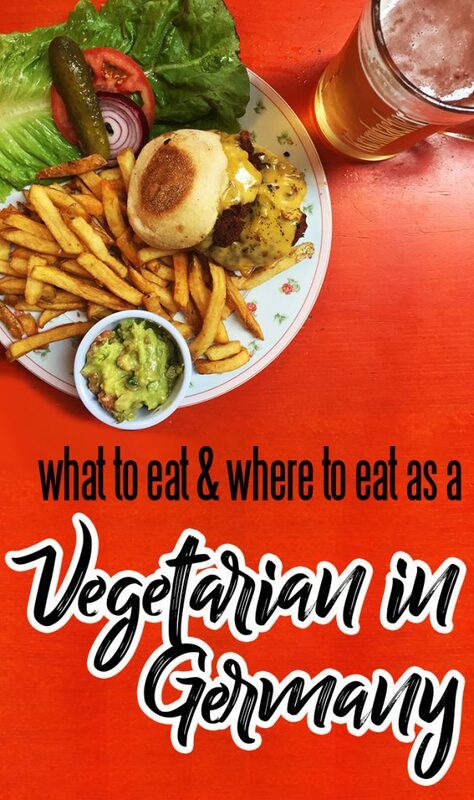 Want to read about the dish that turned me into a vegetarian traveler? Check out my post reflecting on fifteen years of traveling the world without eating meat!